AP Government issued GO No 43 to Allotment of flats for Teachers/ Employees through housing society’s. AP Employees Housing Society Allotment of Flats GO 43 Guideline in Telugu Dated: 24-01-2019. AP Employees Housing Societies Guidelines, Method of Allotment flats, who are Eligible and how to formation of AP Employees Housing Societies more details given below. ఆంధ్ర ప్రదేశ్ రాష్ట్రంలో పనిచేస్తున్న ప్రతీ ఉద్యోగికి ఇళ్ళ స్థలాలు మంజూరు నిమిత్తం అన్ని జిల్లాల కలెక్టర్లకు, ముఖ్య కార్యదర్శులక మార్గదర్శకాలతో కూడిన GO NO 43 విడుదల చేసిన రెవెన్యూ శాఖ ప్రత్యేక ముఖ్య కార్యదర్శి మన్మోహన్ సింగ్ గారు. ఉత్తర్వులు విడుదల చేసిన నాటికి ఏపీలో పనిచేస్తూ, ఉద్యోగి పేరు మీద కానీ, స్పౌజ్ పేరు మీద కానీ, పిల్లల పేరు మీద కానీ ఇంటి స్థలం లేని వారు అర్హులు. ప్రభుత్వ స్థలాలు ఉన్న యెడల ఇంటి స్థలం ఇవ్వబడును. ప్రభుత్వ స్థలం లేకుండా ప్రైవేటు స్థలం ఉన్న యెడల ఫ్లాట్లు నిర్మించి ఇవ్వబడును. ఇంటి స్థలాన్ని 6 నెలలలోగా కేటాయింపు. ఫ్లాట్లను 3 సం.లలోపు నిర్మాణం. 15 సం.ల వరకు సంబంధించిన స్థలాన్ని/ఫ్లాట్ ను అమ్మరాదు. Allotment will be done through House Building societies/ Groups only. Land shall not be allotted in favor of individual employees. The employees shall have to be formed into a Group or Co-operative Society for availing the facility of allotment of land for house sites/flats. A Society or a Group shall have a minimum of 12 eligible members. The employee concerned should apply to the respective Housing Societies/ Group with the sworn affidavit inter alia declaring that they are not owning a house or a house site either in his/her name or in the name of his/her spouse or dependent children in the Urban area/town of allotment. The District Collector shall call for details of the members, who satisfy the eligibility criteria for allotment of house sites/flats. The respective Societies shall submit the applications of each of the members personally signed by them along with their sworn affidavits to the Collector & District Magistrate. District Collector shall keep the applications and sworn affidavits in the district official web-site for information of general public. If any member of the society makes a false declaration, allotment of house site/flat shall be liable for cancellation apart from the member, making such a false declaration, being liable for civil and criminal consequences. On the basis of the applications and declarations, Collector shall assess the requirement of land to be distributed as house sites/flats to the eligible members only and allot the extent of land which is necessary for such allotment to each of the Societies. The land will be provided at nominal rate as approved by Government with recommendation of AP Land Management Authority. An employee should be a member of a Housing Society or Group. The employees, who are forming into a Society/ Group are advised to complete the admission of members before making an application to the Collector. This would facilitate the Society to arrive at exact requirement of land, which can be calculated as per the eligibility criteria and make an application to Collector. If some employees are not covered by Society, Government may allot house sites/ flats to them in next phase as and when they place their requisition before Collector through a society/ Group. 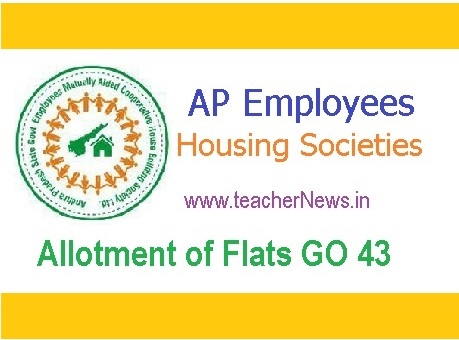 Allotment of Flats for AP Employees Housing Societies Guidelines, who are Eligible and how to formation of AP Employees Housing Societies, GO 43 Download.